The oldest working distillery on the Isle of Skye, set on the shores of Loch Harport with dramatic views of the Cuillins. This alluring, sweet, full-bodied single malt is so easy to enjoy, and like Skye itself, so hard to leave. Talisker Distillery is the oldest working distillery on the Isle of Skye, set on the shores of Loch Harport in the village of Carbost, on the beautiful Minginish Peninsula, with dramatic views of the Black Cuillin. Come and visit us for a tour and taste of our award winning Talisker 10 year old Single Malt Scotch Whisky, see our 5 Copper Pot Stills and the traditional worm tubs that make our Talisker so unique. Take a look in the Warehouse at our oak casks where the Angels Share is lost to evaporation during the maturation process. Skye offers so much to all of its visitors, whether you want to come and relax in some of Scotland’s top class restaurants and accommodation, Kinloch Lodge or The Three Chimneys or for the more energetic visitor, walking and climbing in the Cuillins or The Quirang in Trotternish. Travel from Fort William to Mallaig and enjoy a sail on a CalMac ferry to Armadale and stop off at Armadale Castle in Sleat or drive through Kintail, passing the iconic Eilean Donan Castle, to Kyle and over the Skye Bridge. After visiting Talisker why not take a drive to the Fairy Pools in Glen Brittle or Dunvegan Castle, the seat of the Clan MacLeod. Wildlife and scenery are spectacular no matter what the weather. Sea eagles, dolphins, whales and otters are all seen regularly with the Coral Beaches, Talisker Bay and Neist Point being some of the best places to spot them. It takes a lot of time, patience and a keen eye – and nose – for detail to create one of the world’s best single malt whiskies. As Distillery Manager at Talisker, it’s my task is to ensure that quality is king; after all, no less a man than Robert Louis Stevenson regarded Talisker as ‘the king of drinks’. There’s a great deal of responsibility to ensure that what is laid down for maturation is perfect, so what emerges from the casks in 10, 18 or 25 years’ time is of the usual high standard and continues to receive acclaim in the shape of more awards. Making Talisker demands long hours and no compromises, so I tour the distillery several times a day making sure no part of the process betrays the rest. 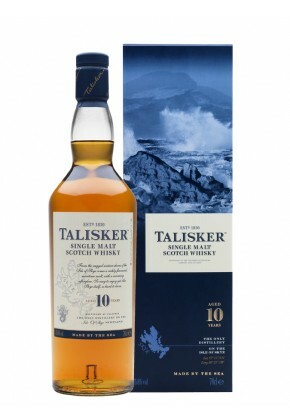 But sharing is part of my philosophy too and I like to think of Talisker as the most sociable of whiskies. Many’s the time I’ve invited guests to sample a dram in my office as together we admire the bleak yet utterly beguiling view of the sea. I bring the same purpose and concentration to my appreciation of whisky. Personally, I find, the more complex whisky becomes, the more interesting it is. It may take a while for your palate to appreciate some of these more ‘peaty’ whiskies, but I’d encourage you to persevere. Although it took me some years to really grasp the characteristics of whisky, it was a very interesting journey, one that continues to this day. I do hope your whisky adventures will be as fulfilling as mine have been. The Classic Malts Selection offers a chance to experiment with some really seductive and intriguing flavours. Naturally, the Talisker 18 year old is my favourite dram, but when it comes to enjoying single malt whisky, I believe it doesn’t matter where you start as long as you enjoy the voyage of discovery.